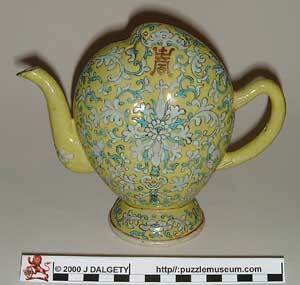 A miniature working teapot only 30cm. across. It has no lid so how do you fill it? This was made by Arkinstall & Son Ltd. of Stoke on Trent, England. They used "Arcadian China" as their trade mark and were the most prolific British manufacturers of Crested China from 1900 to 1939. 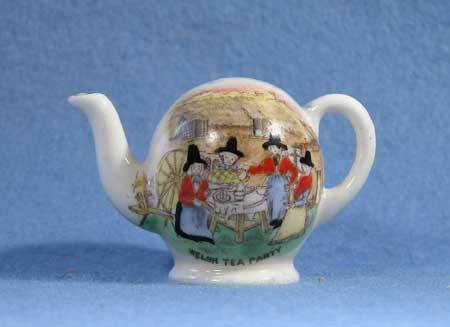 Instead of a crest, this pot has a transfer showing three Welsh ladies in traditional costume. The pot has a hole in the base with a tube running from it to near the inside top; thus it can be filled through the bottom then turned the right way up without spilling. For those of you old enough to remember, they are a bit like an inverted non-spill inkwell with spout and handle added. The principal was made popular in England during the Regency (1811 - 1820) when peach shaped Chinese Wine Pots which worked the same way were imported during the craze for all things Chinese. This Yellow peach shaped pot is from Canton c.1890. The principle seems to have been discovered all over the world. The Puzzle Museum's collections include examples from China, Japan, Indian, North Africa, and the extraordinary one opposite from Peru c.1980. 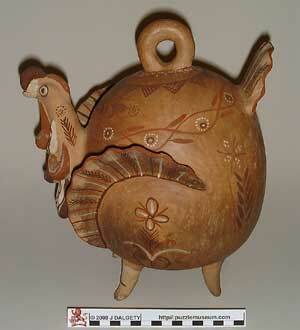 In the shape of a large Turkey, it was probably intended as a water pot; the slight porosity might have kept the water cool by evaporation. The name Cadogan has been attributed to them since they were popularised in the early 19th Century by Lord or Lady Cadogan. One, almost certainly false, legend suggests they made fine "non-spill" teapots for use on the railway. Our senior metagrobologists doubts that they were ever used for tea - How would you have cleaned them after use? It is more likely that they were used for the hot water.